Last week we posted a preview of Adult Swim’s Robot Unicorn Attack [$2.99] and really said everything there was to say about the game. Basically, here’s the gist- Adult Swim has a free Flash game portal which contains many different games ranging from a suicide simulator to a Hook Champ-like swinging game. Robot Unicorn Attack is one of the more popular games on the flash portal, and as of this writing has been played close to 23 million times. Set to Erasure’s Always, you play as a robot unicorn and simply see how long you can survive. Much like Canabalt, gameplay consists of running to the right, jumping from platform to platform, and dashing through stars. I could go on explaining it, or you can just play the game in its entirety for free online. 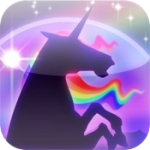 Robot Unicorn Attack translates well to the iPhone, as most games will rarely last any more than a few minutes and both jumping and dashing is handled by default with buttons on either side of the screen or with optional gestures. Everything including the fantastic background music is preserved in the iPhone port, although the graphics have been scaled down to fit the resolution of the iPhone screen. This is a game that is so ridiculous, you can’t help but to love it. Between the silly soundtrack, rainbows everywhere, and both dolphins and sparkles popping up all over the screen when you’re doing well, it’s hard to not smile while playing Robot Unicorn Attack. Give the free flash game a spin, if you like what you see, $2.99 for the iPhone version shouldn’t be too hard to swallow.